Colin Agur, Valerie Belair-Gagnon and Ramesh Subramanian are undertaking a research project about internet policy in India as part of the CGCS’s Internet Policy Observatory. In this post, Agur et al describe perspectives on India’s internet governance sphere from members of Indian civil society. Our research aims to explain transformations in internet governance in terms of interactions among global and domestic players, civil society, private interests, technological infrastructure, and identity. We explore the interactions that produce internet policy in India, emphasizing the relationship between security and internet rights and principles. We study inside and outside influences – including political parties, regulatory bodies, think tanks, internet service providers (ISPs), content providers, transnational and national users – their interactions, and their influence on global meetings. Our project is a history since 2008 of policy interactions in an important national context that has implications for other national contexts as well. Our research focuses on these interactions and asks three fundamental questions: (1) What tensions among state, technology, and market forces shape Indiaʼs internet policy? (2) What effects do external influences such as global associations, multilateral meetings and global political dynamics have on shaping India’s internet policy? (3) What are the trends resulting from this combination of existing policies and global forces? To answer these questions we used an inductive approach. During the spring and summer of 2014, we conducted a series of in-depth, semi-structured interviews with stakeholders in India’s internet governance debate. These stakeholders included political parties, regulatory bodies, think tanks, ISPs, content providers, and users. We also conducted textual analysis of laws and policy documents. Our sample was purposive, since we selected interviewees who are directly involved with the issues of security and internet rights. In our interviews, we asked stakeholders to discuss their experiences dealing with these security issues and participating in discussions, both in India and at global meetings, on how to protect security and internet rights. Several features of India’s internet make it significant for policymaking and for scholars studying global internet governance. First, after a late start, India is now home to a large and fast-growing internet market. Although a relatively small percentage of citizens (15.1% in 2013) have access to the internet, India still has the third largest number (185+ million) of users, after China and the United States. In the years to come, India’s number of users will continue to grow dramatically. Cisco’s Visual Networking Index estimates that the country’s IP traffic will grow five-fold from 2013 to 2018, at a compound annual growth rate of 39%, reaching 3.6 exabytes per month in 2018, up from 680 petabytes per month in 2013. Second, India’s internet infrastructure will expand and improve. Two major factors include the continued growth of mobile internet in India (with most service offered by the private sector) and the National Optical Fibre Network (managed by the Bharat Broadband Network Ltd, a government-owned special purpose vehicle). These infrastructural improvements will allow for more users to access the internet and for greater transmission speeds. What remains to be seen is how effectively they will reduce the urban-rural divide in internet access. Third, in part to encourage rural internet users, the Indian government will undertake major efforts in establishing e-governance mechanisms. According to the Institute for Defense Studies and Analysis (IDSA), India’s National e-governance Program (NeGP) “is one of the most ambitious in the world.” That initiative seeks to bring more than 1,200 services online and encourage effective use of networks to relay data for communication purposes and for commercial transactions. The program involves major sectors such as Defense, Energy, Finance, Land Records, Law Enforcement, Public Essential Services, Security, Space, Telecommunications, Transport, and Utilities. The growth of Indian internet usage has often outpaced efforts to protect its infrastructure and users. One of the vulnerabilities lies in India’s dependence on a few submarine cables that transmit substantial amounts of data. In 2008 and 2011, users in India suffered major loss of access as a result of cuts to cables under the Suez Canal and the Persian Gulf. 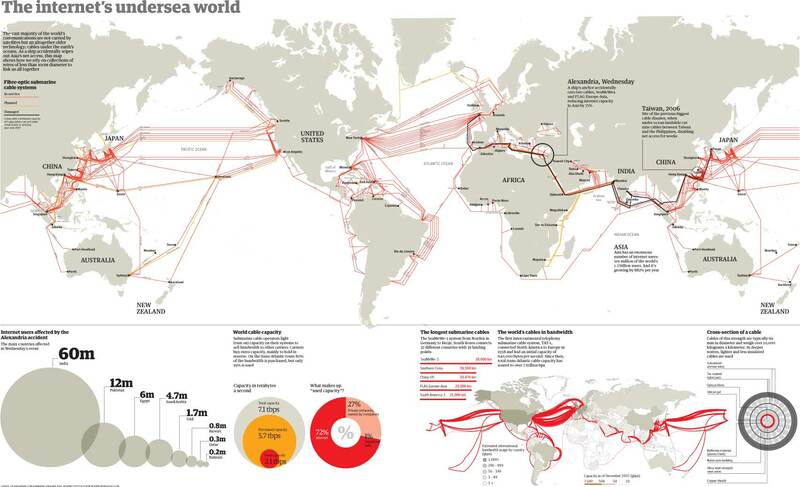 In contrast to trans-Atlantic and trans-Pacific internet traffic, data bound to or from India must pass through a handful of minimally protected cables, which, as happened 2008 and 2011, can be severed by underwater landslides or an errant ship anchor. Other, larger vulnerabilities to the Indian internet involve malicious activity by users inside and outside the country. In recent years, an underground economy has flourished on India’s internet thanks to low levels of computer security. Some estimates show that India is the world’s third-largest generator of spam zombies and a major source of phishing hosts. India has also shown that its internet infrastructure is unprepared to deal with sophisticated computer worms and other malware. Although Iranian nuclear infrastructure was the target of the 2010 Stuxnet attack, India suffered significant collateral damage, with more than 10,000 Indian computers, including 15 in critical infrastructure facilities, affected by the computer worm. In this research we seek to understand the ways in which the Indian government develops policy to manage these, and other, security concerns; the type and extent of internet rights the Indian government has promoted; and the role different stakeholders have in this process. In the first phase of our project we interviewed members of civil society organizations involved in India’s internet governance debates. Our analysis of the interviews revealed five common themes: (1) a desire for a broader understanding of ‘security’ in policy, (2) worries about sovereignty (in light of the Snowden disclosures), (3) eagerness for more accountability in lobbying by US technology giants, (4) encouragement of greater emphasis on users’ rights, and (5) suggestions that the government improve technical knowledge among policymakers and judges. Here we discuss each of these themes in turn. This lack of understanding of technical issues sometimes results in conflicting policies. For example, this is apparent in some of the Indian government’s attempts at regulating the encryption standards used for common internet communications. Kovaks noted that according to Indian regulation, the government has set the “ridiculously low” upper limit of 40-bit key length encryption for users (without seeking government permission). This means that “if you use https on your Gmail, you are, strictly speaking, breaking the law,” as https on Gmail uses higher bit encryption key-lengths. According to Kovacs, the government specifies low-level encryption standards for private communications between citizens “because they want to be able to access everybody’s data.” There are also other contradictions. As Salman Waris noted last year in an article, the Securities and Exchange Board of India (SEBI) prescribes a 64-bit/128-bit encryption for standard network security and mandates the use of encryption technology for security, reliability and confidentiality of data. SEBI recommends use of secured socket layer security, preferably with 128-bit encryption, for securities trading over a mobile phone or a wireless application platform. With the advent of internet banking, the Reserve Bank of India has recommended public key infrastructure as the most-favored technology for secure internet banking services, as per its June 2001 guidelines on internet banking. Our first stage research emphasized the role civil society in internet policy. Our preliminary analysis reveals perceptions and facts from this civil society perspective that inform internet policy-making in India. This includes a focus on user rights, differences in the meaning and understanding of security between civil society and government, and a common interest in national sovereignty. Additionally more unexpected perceptions and facts surfaced, including the technology knowledge-deficit in the judiciary and the influence of foreign giants such as Google and Facebook on the government. Our civil society interviewees also expressed that, when it comes to shaping internet policy outcomes, the Indian government has increasingly used national security considerations to shape the debate and maintain its leading role the policy-making process. Our interviews with civil society organizations involved in India’s internet governance are part of our efforts to learn about (a) the changing power relations that exist in the global multi-stakeholder model, and (b) the ways in which discussions at the national and global levels influence each other and shape policy outcomes. In our interviews with stakeholders, we have sought to understand the interactions and power dynamics at work in India’s internet governance. It is clear that internet policy-making in India is a complex process involving a mix of stakeholders and discussions at the local, national, and global levels. While global discussions of internet governance have been years in the making, national differences (in laws, practices, user culture, and vulnerabilities) continue to persist. In this sense, there is an important and under-studied national element in the governance of global communication networks. International Telecommunications Union (2013). “Time Series Statistics on Individuals Using the Internet, 2000-2013.” Available at: www.itu.int/en/ITU-D/Statistics. Institute for Defense Studies and Analysis (2012). Task Force Report: India’s Cyber Security Challenge, p. 20. Institute for Defense Studies and Analysis (2012). Task Force Report: India’s Cyber Security Challenge, p. 23-24. The Federation of Indian Chambers of Commerce and Industry is an association of business organizations in India. The National Association of Software and Services Companies is a trade association in India’s IT sector.